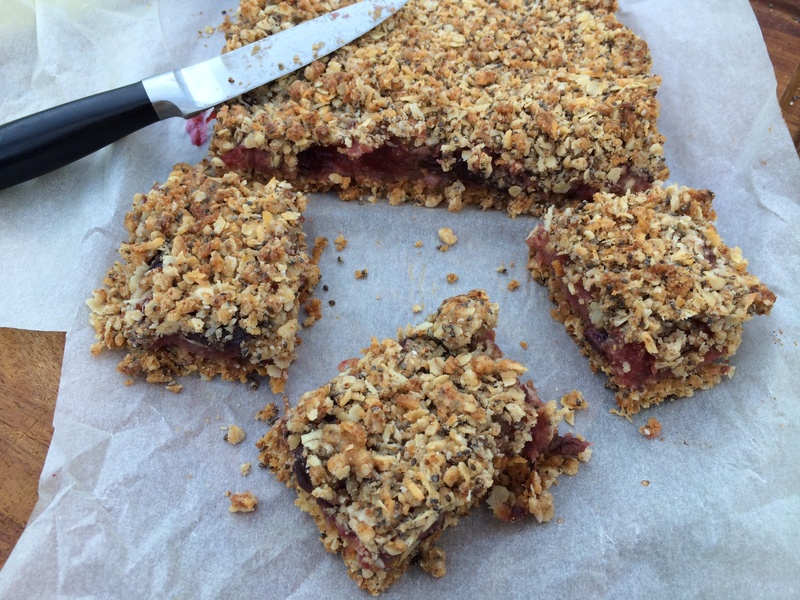 After very kindly being given some freshly grown rhubarb (thank you Des and Lisa 🙂 ) I thought I would try to do something different with it, rather than the classic crumble and came up with this little beauty! 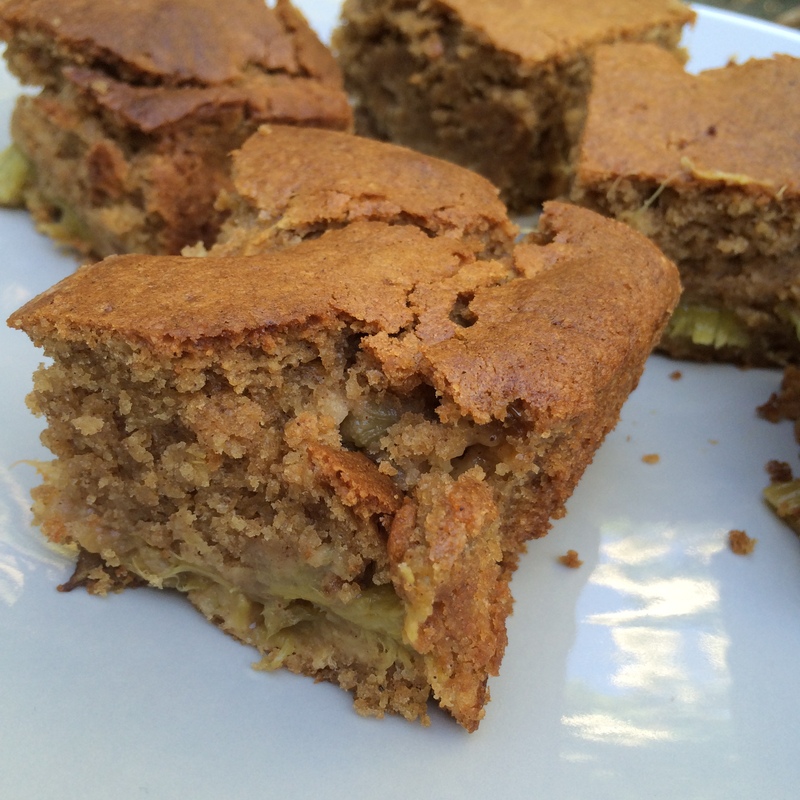 This is a moist but light cake and the tartness of the rhubarb goes so well with the warmth of the cinnamon. 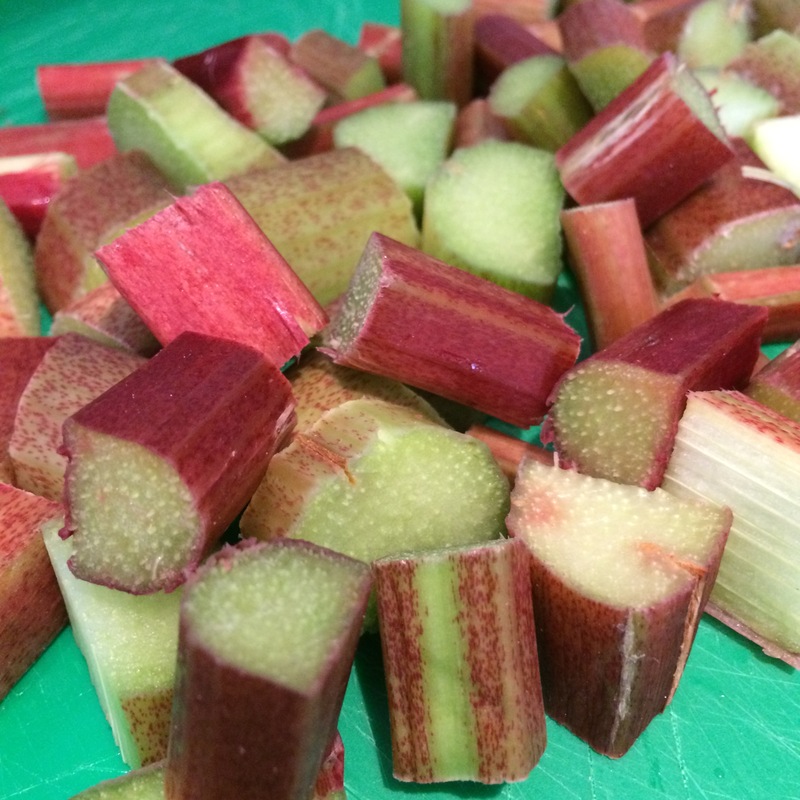 I choose to poach the rhubarb lightly first as I find it ensures it is non-stringy and deliciously soft. First you need to poach the rhubarb. 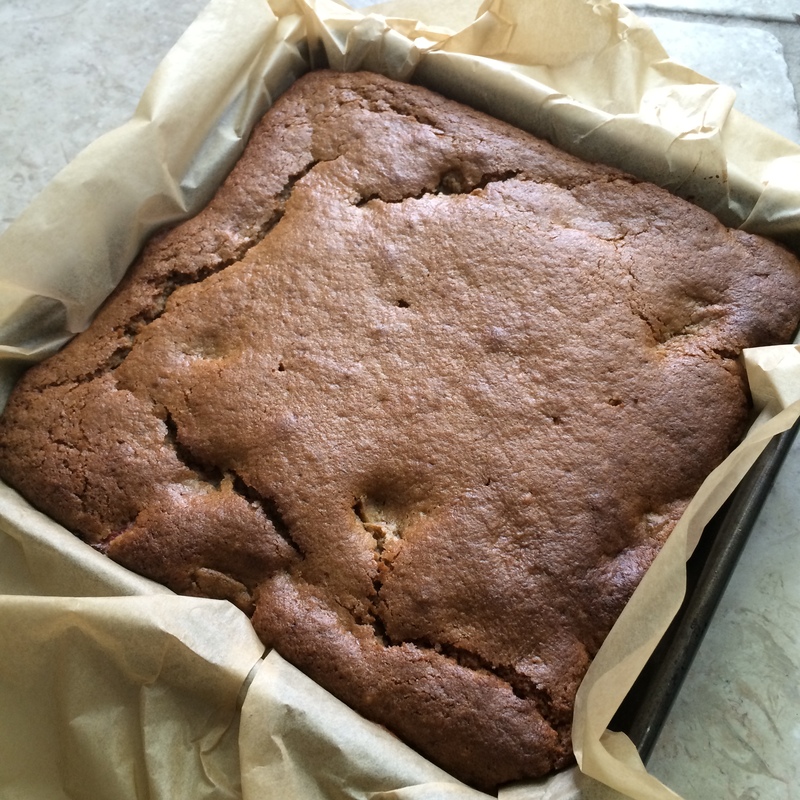 Pop it in to a roasting tin (so it’s only one layer thick) and add the apple juice and 1 tbsp sugar. 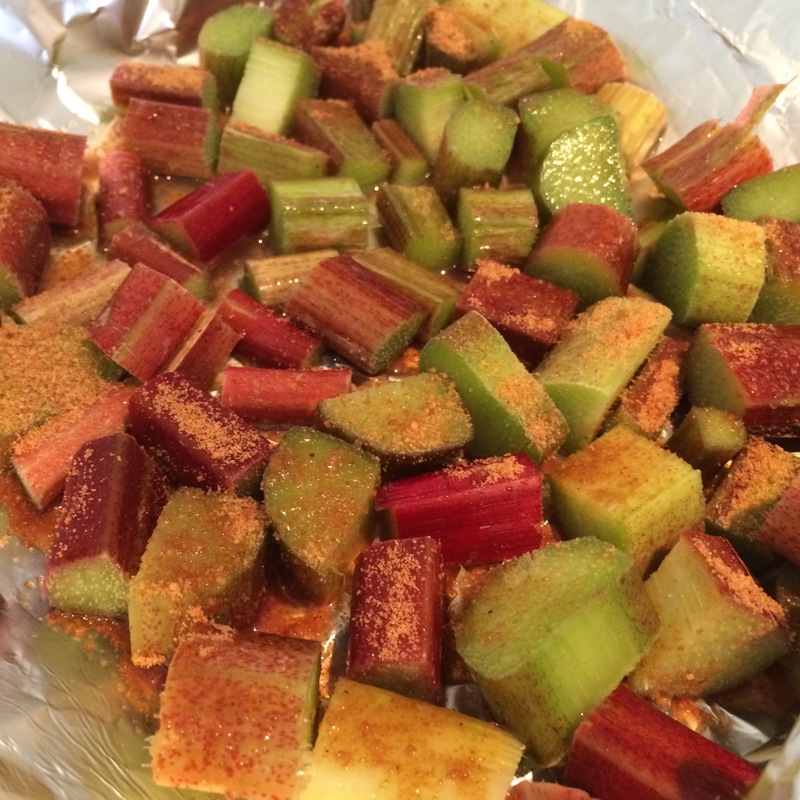 Cover with foil and bake for approx 15 mins (or until the rhubarb is a little soft – the time will vary depending on how thick your stalks are). 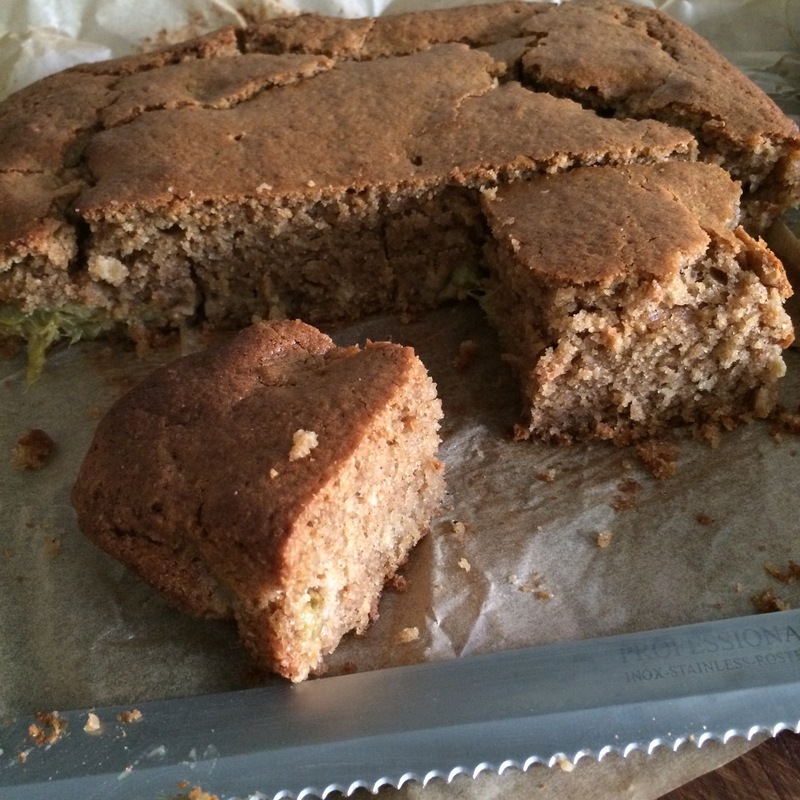 Remove from oven, strain and set aside (keeping the juice – we need that later). Leave the oven on but increase it to 170 C.
Place the flour, sugar, cinnamon and ground almonds in to a bowl and mix together. Pour the juice from the poached rhubarb into a measuring jug (if there isn’t much don’t worry – use it anyway) and then add enough milk to give 1 1/4 cups in total of liquid. Add the vinegar and stir. Then add the bicarbonate of soda and mix (it will fizz!). Add this to the dry ingredients, and then add the oil. Stir it well and finally fold in the rhubarb. 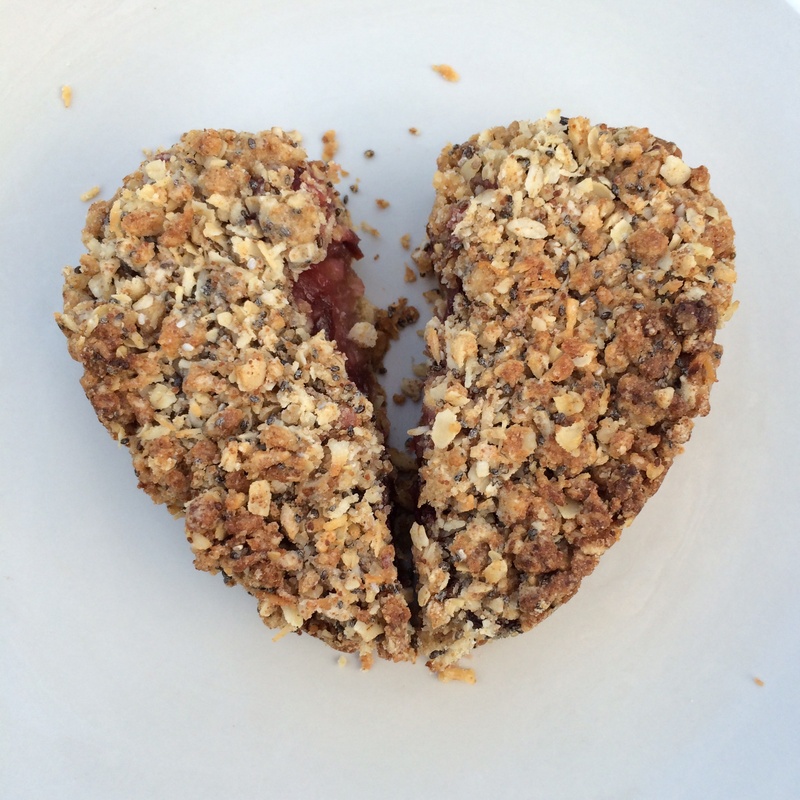 Cherry and apple flapjack slice and a whole lot of love! 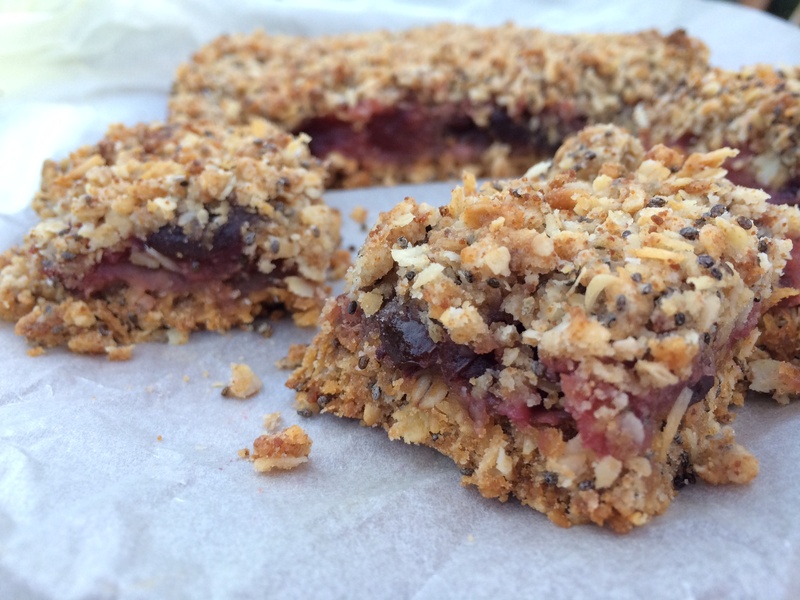 This is SO much better for you than traditional flapjack slices – it’s full of wholefoods and the addition of the chia seeds gives an added Omega boost too! You could use store bought compote but they tend to be full of sugar so have a go at making your own if you can – it’s so easy! To make a quick cherry and apple compote take one punnet of cherries (pitted and roughly chopped in quarters) and approximately 3 – 4 Bramley apples (peeled, cored and chopped) and place in a bowl. Pop in the microwave and cook in short bursts until the apple has softened and the cherries are cooked through (can also be done in a saucepan on the hob). 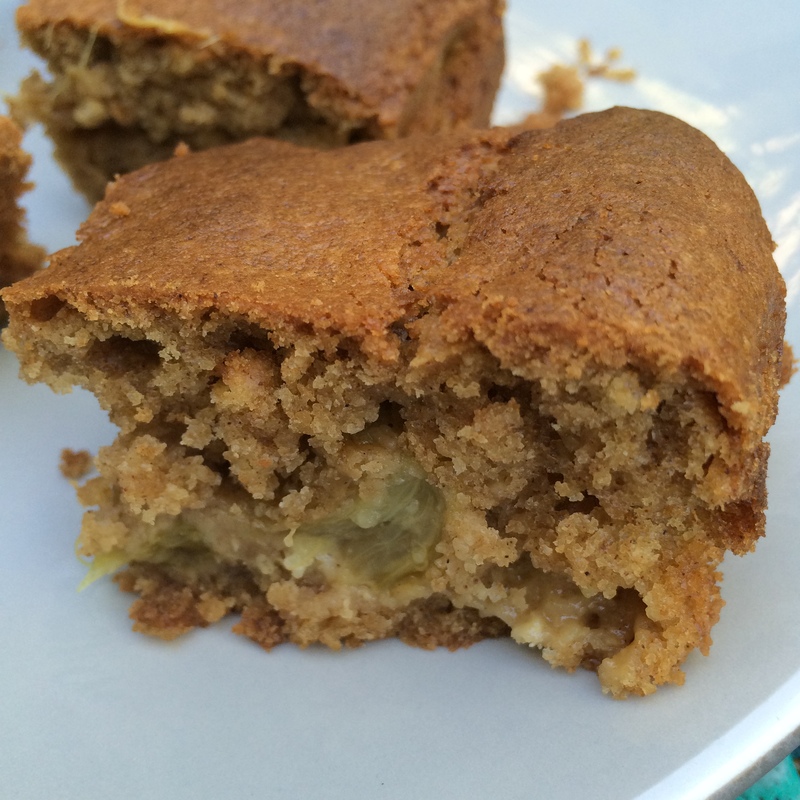 If required add a little unrefined sugar to sweeten (though I prefer it without sugar). Allow to cool. Add the flour, oats, coconut, sugar, chia seeds, ginger and salt to a large bowl and mix well. Add the coconut oil and rub it in to the dry mixture using your hands to create a breadcrumb consistency. 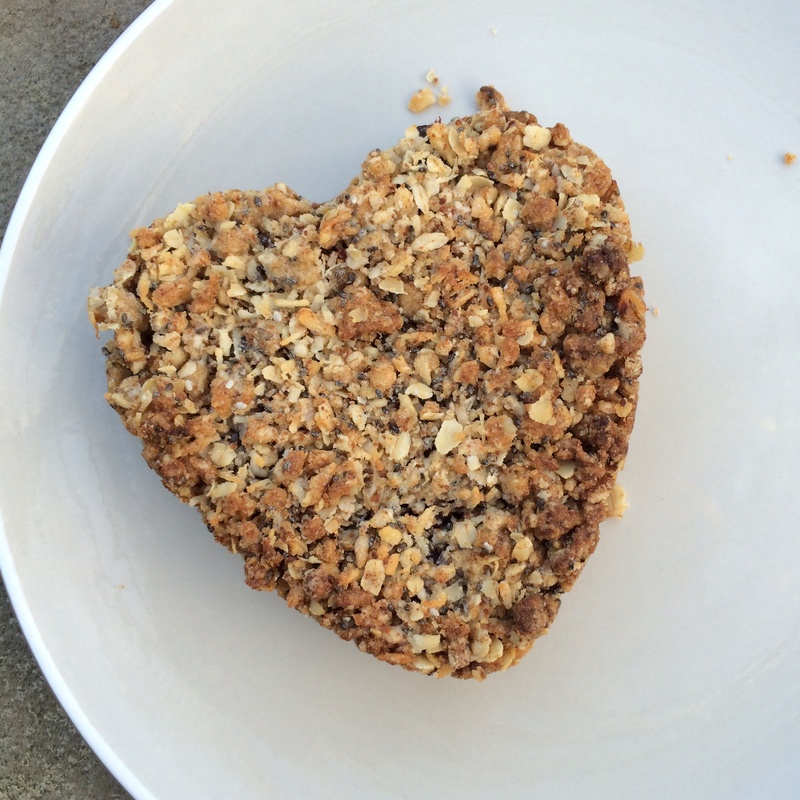 Add the liquid sweetener and mix in to form a crumble-type mixture. Line a rectangular or square (or heart shaped!) baking dish with baking paper (ensure the baking paper comes up the sides so you can easily remove the flapjack from the tin later). Take just over half of the mixture and place in to a lined baking tin and flatten well. Bake in the oven for 20 – 25 minutes until it starts to brown. Remove from the oven and spread the compote over the base. Put the remaining crumble mix over the top and lightly press down. Bake in the oven again for 20 – 25 mins or until it browns.